Artwork Panel: 29cm x 43.8cm ≈ 11½" x 17¼"
Silk/Brocade: 38.4cm x 102cm ≈ 15" x 40¼"
Width at Wooden Knobs: 47.4cm ≈ 18¾"
This Japanese woodblock print reproduction features the Geisha or Courtesan Shigeoka (重岡) of the Okamotoya (岡本屋) house, strolling Kyo Street. 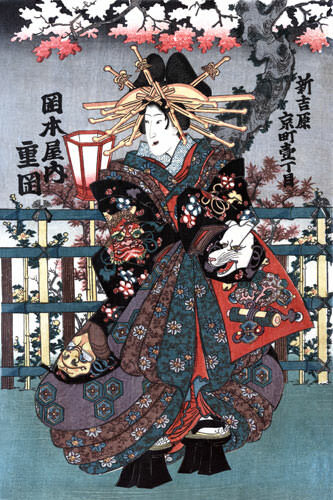 Title Translation: The courtesan Shigeoka of Okamoto-ya. Date of Original Artwork: Between 1848 and 1868.